Attention all foreigners: when an English person tells you to put your things in the boot of the car, what they actually are referring to is the trunk (why didn’t they say that in the first place ?). Many years ago a very stylish friend of mine asked me “do you want to go to a boot sale”? “Sure” I said, envisioning coveted access to a Manolo Blahnik sample sale. She picked me up and we started driving out of London on the M1. Obviously not, I said to myself. Had I, I might not have accepted the invitation so enthusiastically. 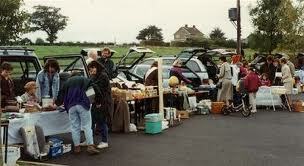 Car boot sales are somewhat of a British institution. Imagine a giant flea market with the boot/trunk of cars filled with anything from unwanted household or personal possessions (junk) to overlooked treasures. They are traditionally held in car-parks, open fields or fairs in the countryside. You must be wondering why a blog called stylishmews (emphasis on stylish) would be devoting a post to the above subject. This Sunday, October 12th, make your way to the Southbank Centre to find out. If there ever was a stylish car boot sale, this would be it. 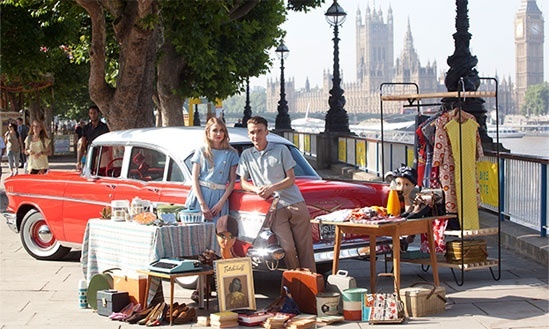 Billed as London’s first Classic Car Boot Sale, this one can be found along the riverfront at Southbank Centre between Queen’s Walk, Hungerford Bridge and Jubilee Gardens. If you are a lover of vintage clothing, accessories, pop culture memorabilia, vinyl records, housewares and collectibles all of it will be traded from the boots of about 70 cars, including an Aston Martin DB4, a mint Chevy Belair and a 1973 Ferrari Daytona. Let’s not forget about food! Vintage vans will be dishing out artisanal sausages, lobster rolls, and hamburgers. Drinks will be mixed from a stylish mobile cocktail bar. There will also be loads of live entertainment including British Music Experience’s ‘Traffic Jam’, a renovated Austin Morris J4 Dormobile, in which DJs play a mix of music inspired and influenced by Lord Kitchener’s 1950s calypso classic, London is the Place for Me. Budding musicians can try out a selection of instruments, such as a tea chest bass, ukulele and percussion steel pans. Who knows, you might just come home with an overlooked gem?